Visit Magnotta, Canada’s most award winning winery, where an exceptional winery experience awaits you. Shop our vast selection of VQA and International Series award winning wines, spirits, beer, wine accessories and gourmet food items. Enjoy a complimentary tour of our 60,000 square foot facility that includes an overview of our state-of-the art winemaking equipment, bottling techniques and our temperature controlled underground barrel cellar. Your tour is completed with a wine tasting of four Magnotta wines in the Awards Room and weather permitting, you can enjoy our outdoor patio featuring an original bronze by renowned sculptor Lea Vivot. Following your tour peruse our original art collection featured in our retail store, including international and local works including a selection of bronzes and statues. 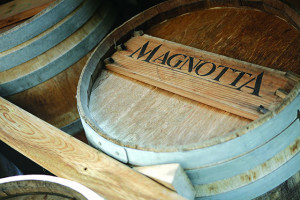 Magnotta, a truly exceptional winery experience. Visit Magnotta, Canada’s most award winning winery, open 7 days a week, all year round! Complimentary tours daily at 2:00 pm. Open seven days a week, year round. you can contact Magnotta by calling them at 905-738-9463, or visiting them online.